A jubilant Conway (12) celebrates scoring. AFLW GF 2018, Ikon Park, Melbourne, Australia. Kim Densham for AFANA. Joe Daniher has eyes on the ball, Essendon v Adelaide, Round 1, 2018, Etihad Stadium, Kim Densham for AFANA. "We seek to further the development and exposure of the most exciting game in the world, Australian Football, in North America." It’s a short turnaround with the Easter round just complete and the Anzac round starting on Wednesday night. 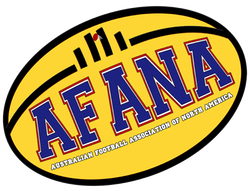 This gives us little time to roll through the AFANA AFL Power Poll so this one will be short and sweet! Round four once again gave us a fair share of upsets, with both Western Australian teams heavily featured. At Optus Stadium in Perth, premiership favorites the West Coast Eagles were given a wet weather football lesson by Port Adelaide in a 42-point Power victory, while the Fremantle Dockers shocked the Greater Western Sydney Giants in Canberra with a sensational 24 point win. Port Adelaide Power used speed and wet weather grunt to comprehensively thrash the West Coast Eagles at Optus Stadium. The Eagles fielded a team unsuited to the conditions. It was cold, wet and windy and a team loaded with three tall forwards and two ruckmen, would always struggle in the slippery conditions. The Power lacked the height of the Eagles but they made up for it with midfield muscle and quick ball movement. There is a young footy player in Bendigo, a town in central Victoria about 93 miles northwest of Melbourne. Nothing unusual about that as many young teens play for local clubs. However, 13 year old Bradman Thompson ran into a problem when he went through a growth spurt and shot up to 6'4" since last year. So much so, he could not find a pair of footy socks that would fit and the club he plays for is very strict about team uniforms right down to the socks - no variations. In a game that lacked highlights but offered plenty of interest, the West Coast Eagles withstood a determined Fremantle Dockers to win by 13 points. The depleted Dockers threw everything they had at the reigning premiers, but in the end were defeated by their own inaccuracy in front of goal. This is intended for you to add to your personal calendar and lists Fox and TSN networks only. The individual calendar events contain further details in the description (click on an entry). For a full schedule see our TV schedules web page.